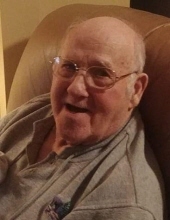 Joe Harold Adams, a native of Redford and a former resident of Livonia, Coleman and Oscoda, died peacefully on February 7, 2019 in Commerce Township after suffering a heart attack a week prior. Joe was born on September 4, 1932, the youngest of three boys born to Roy and Allie (nee. Quinn) Adams. Joe grew up in Redford and graduated from Redford Union High School, the same school that all of his children and a great-grandson would later attend. It was also at Redford Union where Joe met his high school sweetheart, Arlene. They were married for over twenty seven years and raised three daughters. Joe was a proud and involved father — he was their softball coach and some of the things he taught his girls were how to shoot guns, ride motorcycles, archery and identify animal tracks. The same lessons would later be taught to his grandchildren, who he also taught to fish, work on cars and drive his boats. An avid outdoorsman and gardener, Joe enjoyed many years in Northern Michigan with his second wife, Janet, to whom he was married for twenty nine years until her passing in 2012. The couple enjoyed travel and winter in Florida. For over forty years, Joe worked as a maintenance welder for Kelsey Hayes Automotive Company. Joe was a talented craftsman and ever generous. After his retirement in the late 1980’s, Joe decorated his family’s homes with his planter creations from scrap pieces of brake drum, he made metal sculptures, tables, grandfather clocks, coffee tables, end tables, mantles and more. Joe will be missed for his sense of humor, his funny, teasing nature and his gentle and loving soul. He is survived by his loving daughters, Pam (Doug) Lewis, Kim (David) Tworkowski, Kelly (Blaise) Glander; their mother, Arlene Dale; grandchildren, Bradley (Tracy) Tucker, Dan Wishart, Amanda (Mike) Childers; great-grandchildren, Alyssa, Rhys and Rowan; as well as nieces, nephews, extended family members and friends. He was preceded in death by his wife, Janet in 2012 and his brothers, Roy Jr. and Clarence Hugh Adams. A Funeral Service will be held at Lynch & Sons Funeral Home, 404 E. Liberty St., Milford on Monday, February 11, 2019 at 11 AM, with visitation beginning at 10 AM. Friends may visit the funeral home on Sunday, February 10, 2019 from 2-7 PM. In lieu of flowers, memorial contributions may be made in his name to the American Diabetes Association or to the American Heart Association. "Email Address" would like to share the life celebration of Joe Adams. Click on the "link" to go to share a favorite memory or leave a condolence message for the family.